What’s the Skinny on Whole Grains? | Gastrointestinal Specialists, Inc.
What’s the Skinny on Whole Grains? In the endless sea of food labels, the phrase “Whole Grains” is one of those food categories that can be confusing for people. So, we’re taking the opportunity to share exactly what the term “whole grains” means and why you should seek them out over their counterpart, refined grains. First off, when we talk about grains, we’re referring to cereal grains: barley, brown rice, maize, millet, oat, rye, sorghum, spelt and wheat. But a grain can be considered “whole” even when it’s ground into flour. The difference between products made with whole grains and products made with refined or enriched grains is the parts of the grain used to make the product. The label “Whole Grain” means that all three parts of the grain (the bran, germ, and endosperm) are present in the same proportions as when the grain was growing in the ﬁelds. The bran is the outer skin of the whole kernel. It contains antioxidants, Vitamin B, and fiber. The germ is the embryo. It contains Vitamin B, proteins, minerals, and healthy fats. The endosperm is the germ’s food supply. It contains starchy carbohydrates and proteins. Together, these three parts make grains nutritious because they provide plenty of fiber, protein, and other important nutrients. A refined grain has the germ and bran removed during the milling process, leaving the grain without its two important parts. In fact, refining a grain removes about a quarter of the protein in a grain, and half to two thirds or more of a its nutrients. An enriched grain is one where many of these missing nutrients are added back. They aren’t added back in the same proportion though, making the product less nutritious than just eating the whole grain. Whole Grains give you fiber, a healthy plant-based protein, vitamins, minerals, and phytochemicals. Studies have also shown that Whole Grains reduce hypertension, lower your risk of heart disease, stroke and diabetes, and protect against arterial plaque buildup. Having that bran and fiber in your diet slows the breakdown of starch into glucose, which helps maintain a steady blood sugar, helps lower cholesterol, prevents the formation of blood clots, and helps food move through the digestive tract. Navigating the aisles of the grocery store can be tricky. Food labels and packaging claim all kinds of things that trick consumers into thinking they are healthy. Start by looking for the 100% Whole Grains stamp. You can also look at the ingredient list. Look for terms like 100% whole wheat or whole grain. 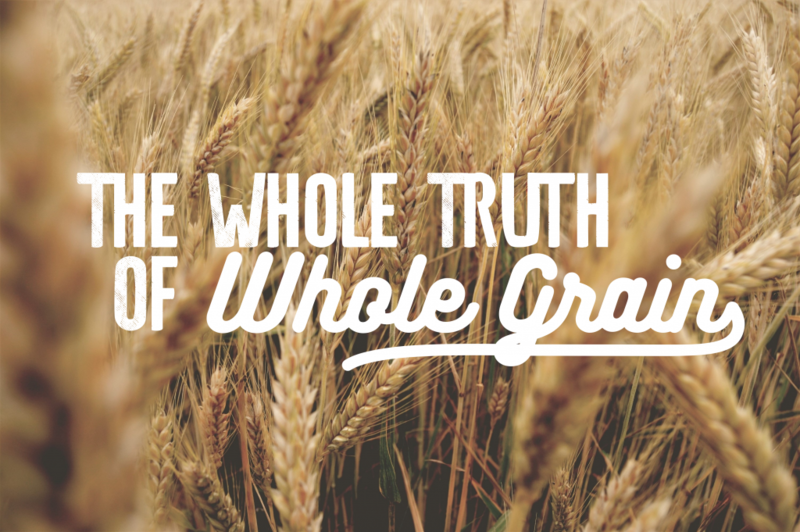 Look for the term “whole” in front of the types of grains. If it simply says “wheat” or “wheat flour” or “Corn” without the word whole in front of it, you are missing out on the WHOLE grain. The Whole Grains Council has an excellent resource on identifying whole grain products. Do not seek out whole grains if you have Celiac Disease, Gluten Sensitivity, Irritable Bowel Syndrome, or Diverticulitis. Have questions? Give us a call! Candida: What is it and how does it affect you? Expiration Dates: Rules or Guidelines?